LG’s Tropical Dual Inverter Compressor that works even at 65℃, users can enjoy the benefits of LG air conditioner for a longer period of time. The revolutionary technology is highly efficient inverter has a high performance. Inverter Compressor constantly adjusts a compressor’s speed to maintain desired temperature levels. Moreover, Dual Inverter Compressor with power saving operation range frequency saves more energy than a conventional compressor. Thanks to the Dual Inverter compressor, air is expelled farther and faster. Compressors on typical air conditioners turn off and on in order to adjust temperature, consuming a great deal of energy. Dual Inverter Compressor constantly adjusts a compressor’s speed to maintain desired temperature levels. This minimal fluctuation saves energy and ensures greater cooling comfort. 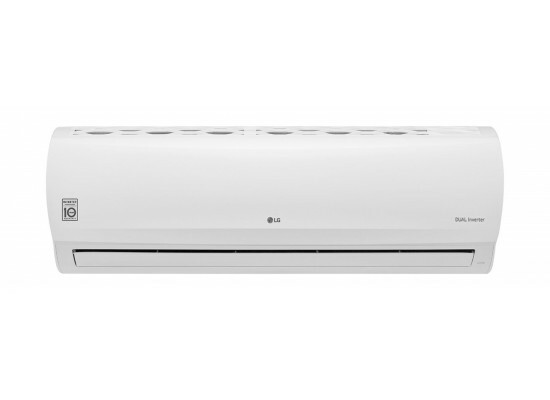 LG air conditioners operate at low sound levels, thanks to LG’s unique skew fan and Dual Inverter Compressor which eliminate unnecessary noise and allow for smooth operation. The Compressor speed of LG Dual Inverter Compressor is constantly adjusted and varied to maintain the desired temperature with minimal fluctuation. LG air conditioners are designed for easier and more efficient installation, regardless of the surroundings and the number of persons involved in the installation process. By reducing the manpower and time required for installation, it is now possible to install more air conditioners at more homes in a shorter period of time. Avail the utmost comfort sleep environment by automatically adjusting different functions with the simple click of a button. LG air conditioners deliver cool air to every corner of your room. The 4-way swing function blows the air quickly and efficiently in many directions. It prevents forming of bacteria & mold on the heat exchanger. Thus provides a pleasant environment. The Dual Protection Filter captures dust size over 10㎛ and bacteria. LG’s unique new skew fan & low vibration compressor technology achieve world’s lowest sound levels.